Der Artikel John Abercrombie (1944-2017): Gateway - In The Moment wurde in den Warenkorb gelegt. 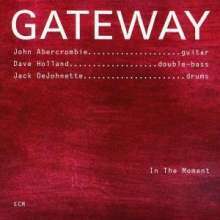 18 years after their collective album "Gateway 2" and 15 years after they had given a concert performance together, the three protagonists of Gateway-John Abercrombie, Dave Holland, and Jack DeJohnette-reunited in the summer of 1994 for an extended tour. The group then returned to the studio to make "Homecoming" their "comeback" album, which was released the following year to a chorus of critical approval. In truth the session from which "Homecoming" was drawn was a particulalry productive one, the level of interplay sufficiently high to fuel more than a single album. After the band had worked its way through its new repertoire of preset tunes and heads, producer Manfred Eicher encouraged them to keep playing. "In The Moment" is a collection of freely-structured group improvisations created spontaneously yet drawing on experiences shared over the course of a quarter-century. M. Schmidt in Stereo 9 / 96: "CD des Monats. So geraten die Blues- und Fusion-Exkursionen des Trios zu sechs kleinen, aber feinen Meisterwerken, bei denen wirklich alles stimmt: die Atmosphäre, die Dramaturgie und der Sound. Das Ergebnis ist tatsächlich eine dieser raren Rock-Jazz-Scheiben, denen man absolut bedenkenlos das Attribut 'zeitlos' ausstellen kann."